LISBON — The top three in the batting order combined for nine hits and 10 RBIs as Lisbon hung on to defeat Columbiana 17-15 on Monday in Eastern Ohio Athletic Conference play. Lisbon improved to 6-0 and 5-0 in the league. The two teams play at Columbiana today. For the Devils, Justyce Vrable had four home runs and seven RBIs, while Autumn Oehlstrom had a home run, two singles and an RBI. Kenedy Vrable had a double, single and two RBIs. Mallory Gallo had four hits. Columbiana was led by Julia Rapp’s three hits including two triples and four RBIs. Maci Linhart and Tori Long each had two hits. GREENFORD — South Range’s softball team topped Hubbard 3-1 on Monday. Jillian Strecansky had a home run for the Raiders, 5-3, 3-2 in the Northeast 8. Bree Kohler struck out 12 and also had a double. South Range is at Hubbard today. SR–Bree Kohler, wp (12K, 3BB) and Jillian Strecansky. H–Haley Creole, lp (5K, 2BB) and Hannah Kist. TORONTO — Harlie Detrick’s two-run double in the first inning put East Palestine on its way to a 4-2 win over Toronto on Monday. 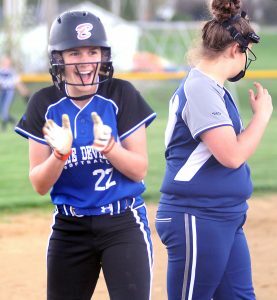 Detrick had two hits and three RBIs, Kenzee Johnston collected three hits and Joclyn Fristik walked twice and scored two runs. Jade McBride tossed a four-hitter in the complete-game victory. East Palestine (3-4, 3-3 EOAC) will host Toronto at 5:30 p.m. today. EP–Jade McBride, wp (7IP, 7K, 1BB) and McKenna Griffith. T–Anderson, lp (7IP, 9K, 3BB) and Reed. COLUMBIANA –Crestview scored eight runs in the bottom of the first inning and beat Campbell, 11-1, in five innings Monday. Skyler Mattern had a double, two singles and two RBIs for Crestview. Haley Eskra collected three singles and an RBI, while Baylie Bettura, Shianna Mathes and Olivia Strank each had two hits. Pitcher Kayla Deily picked up her first win of the season. Crestview (11-2) will host Beaver Local today. CR–Kayla Deily, wp (4 2/3IP, 1ER, 6K, 2BB).